Red Lentil Curry affectionately known as parippu amongst Tamils, is a simple dish that accompanies vegetarian meals and sometimes non-vegetarian ones as well. The preparation of this infamous comfort food varies from home to home although the main ingredient remains the same. My mom tempers dried red chillies along with onions and spices in her version and I use fresh green chillies in mine. Regardless of how it is prepared, this is a staple dish that is enjoyed by most ifnot all. Below is the recipe that I make most often — It is not spicy and therefore all of us can enjoy it. I have made other versions of this recipe by adding fresh tomatoes, as well as roasted chilli powder and extra fresh green chillies for spicy parippu curry which my husband loves. My kids love parippu with carrot and zucchini cooked right in. No matter how you choose to prepare your parippu curry, it is one of those dishes that you cannot make wrong. Rinse the red lentils in cold running water. Then let soak in water and set aside. Heat the ghee in a pot on medium heat. Add the chopped onions, cumin seeds, and green chilli. Stir until onions are translucent. Drain the lentils and add to pot. Add the water, turmeric powder, garlic, and salt. Let the lentils cook uncovered until soft, stirring occasionally to prevent burning of the bottom. Once the lentils are almost cooked, add the coconut milk, curry leaves. Let cook for an additional 5 minutes or until lentils are fully cooked. 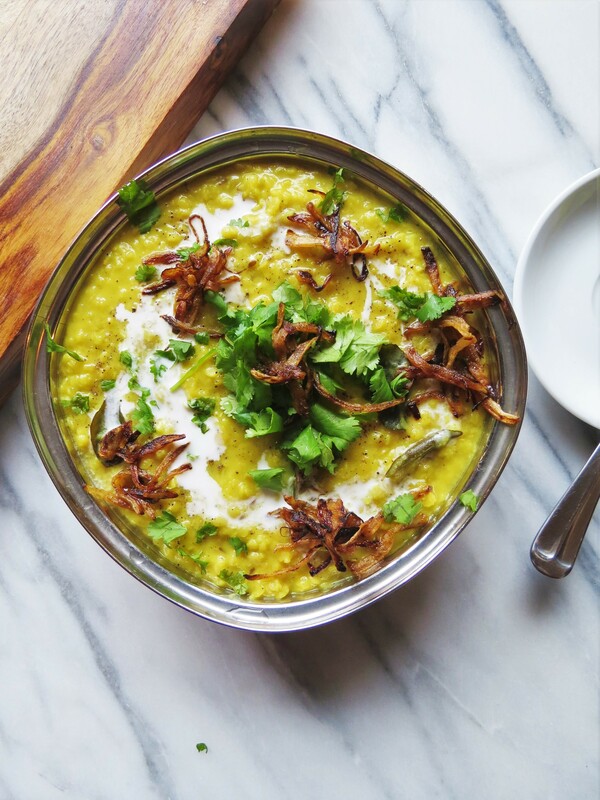 Top with fried onions and coriander leaves before serving, if desired. If you like a thinner consistency, simply add more water. Keep in mind that the curry will thicken as it cools. To make the fried onions, evenly slice a medium white onion. Add onions to a non-stick pan with 2 tsp of oil, a sprinkling of salt and roasted chilli powder. Stir until onions turn brown and crisp. Serve warm with rice and curries of your choice, or with a crusty bread. My children love parippu topped with a generous topping of Balkan style yogurt, plain basmati rice, and pappadum (lentil crackers). 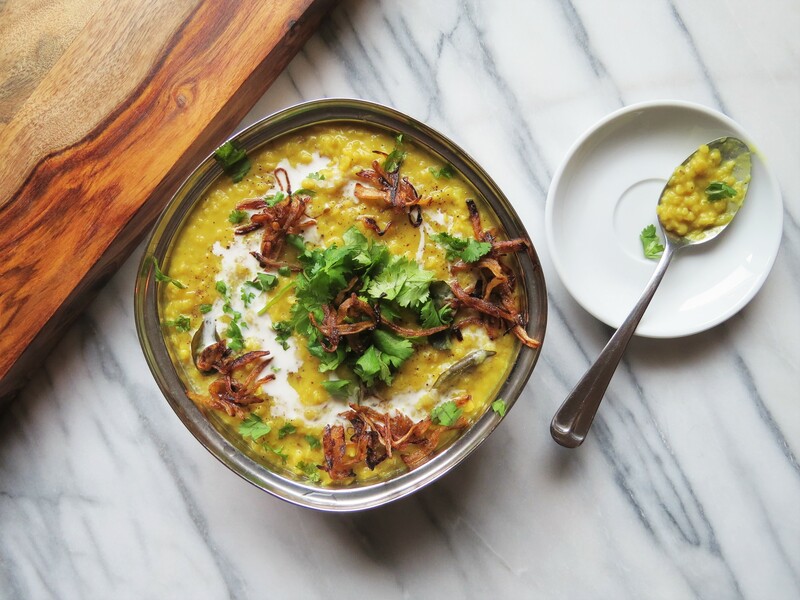 Have a great recipe for red lentil curry that you want to share? Post it the comments below or email me via my contact forumn for a chance to be featured on the blog!